Rocla Stacker Ties are the cost effective solutions for crane rail applications. Rail is used in many types of industrial material handling applications such as Gantry cranes, which traverse over fixed track. These types of cranes are commonly used in port terminals and industrial manufacturing facilities, and move immense loads of containers and other types of freight over thick webbed crane rails. 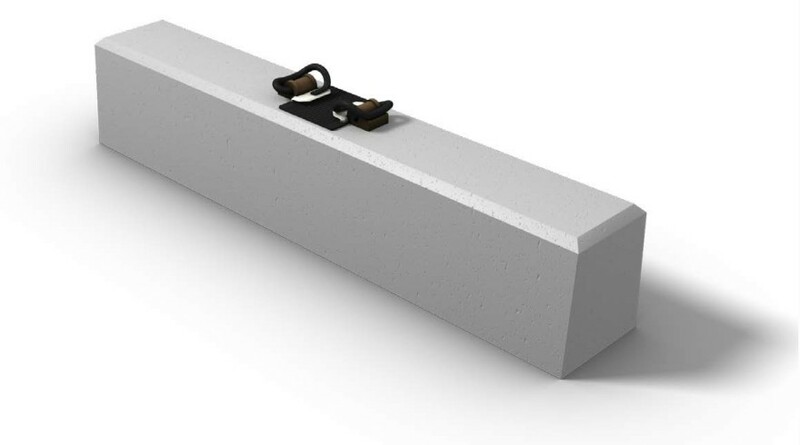 Concrete is commonly utilized in crane rail infrastructure, providing the durable stability required to withstand the stresses and strains caused by heavy loads. As in the railroad industry, Rocla concrete tie products are the trusted track foundation for all types of material handling applications. We offer Stacker Ties for crane rail applications which is a cost effective alternative to embedded rail. And like all concrete tie products, we provide custom designs to meet the needs of each and every individual project which is key when providing solutions for unique material handling applications. The Stacker Tie is a Rocla custom solution for projects requiring concrete ties for crane rail applications. Ties are customized to project needs as a cost effective alternative to embedded crane rail. Fastening Systems: fastening systems featuring tension clamps (Skl) and screw-dowel combinations (Vossloh); screwless fastening systems featuring clips and anchor bolts. Tie Spacing: 30" - 44"